A unique touch for your celebration. 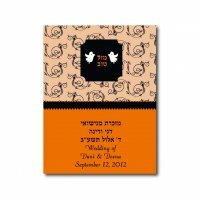 In honor of Thanksgiving and Hanukkah, these are cupcake wrappers and toppers with an orange palate. This is a digital file that you may print on your own printer or via your local print shop. 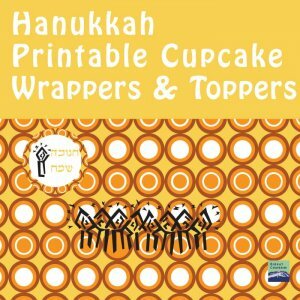 1 Printable 8 x 10 sheet of Hanukkah cupcake wrappers. Two per page.One wrapper has eight candles and a "shamash" on the topper and one wrapper has eight candles and a shamash. 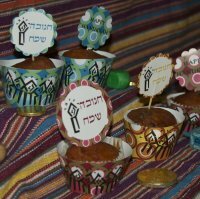 One page of Hanukkah design Toppers with the message "Happy Hanukkah" in Hebrew (with the font in the image) with a shamash and Happy Hanukkah in English without the Shamash. The design is shapes as squares to be cut with a 2" round scrapbooking punch. To print at home print on cardstock or photo paper. Set printing to the highest / best quality. Make sure scaling is deselected or the images will be made to shrink or enlarge. Set printer to Borderless printing. NOTE: Colors vary monitor to monitor, as well as printer to printer. Colors printed may not exactly match what you see on your computer screen.